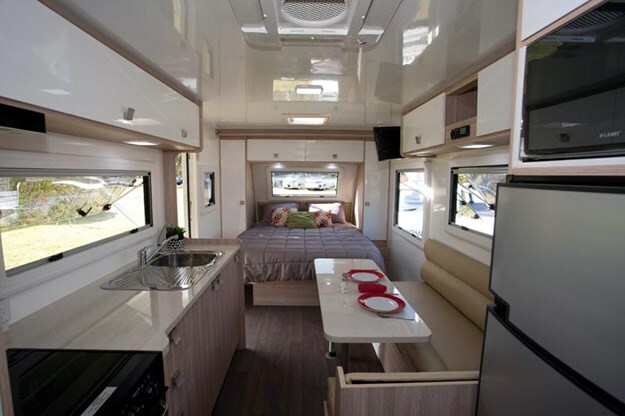 Family caravans seem to be on a bit of a rise in Australia at the current time, which I’m basing on the fact that most of the larger manufacturers now seem to have at least one bunk van model in their lineup. 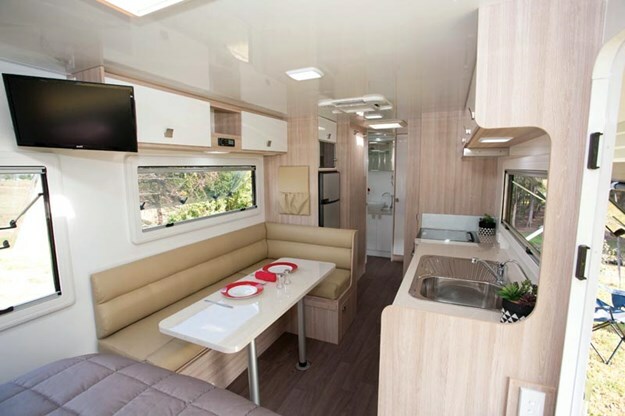 Brisbane-based Winnebago is no exception to this, and whilst a number of its caravans are three-berth, ie fold-down the dinette for the third bed, the Mossman C is definitely the full kit with a double bed up front and two bunks down the rear. Or, as in the case of my review caravan, there is an option for a third bunk. With a length of 6.82m (22ft 4in) and a payload of 826kg, the Mossman C is well suited for family travel. 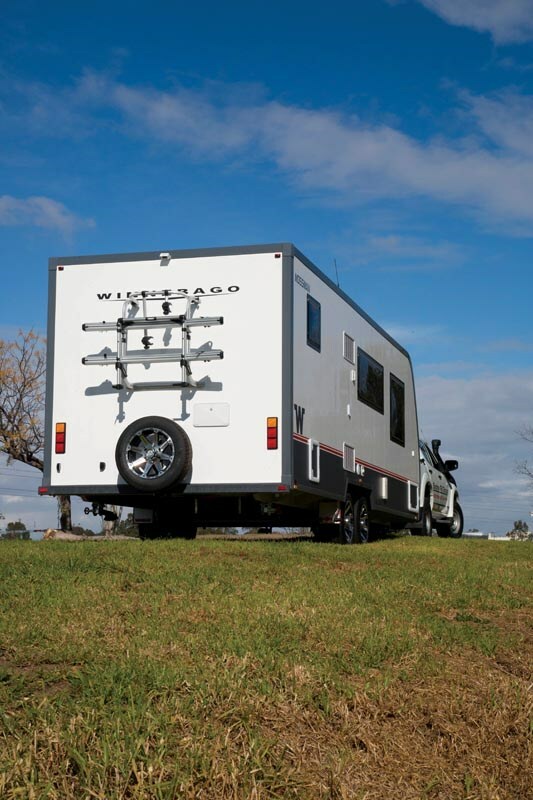 Most of the Australian caravan industry is Melbourne regional based and, for that reason, many manufacturers tend to follow the same path in terms of construction methods. Those in Queensland, it seems, often tend to do things differently and Winnebago follows this philosophy. Whilst the 150mmx50mm (6inx2in) hot-dipped galvanised railed chassis and drawbar has a familiar look, the frameless body (no discussion required in the benefits of wood or aluminium) is a little different. Fibreglass composite panels with an insulating core are used. To minimise water leak problems the front wall and roof are all one piece, as are both walls and the floor. The Mossman body has quite a distinctive shape and quite an attractive colour scheme with a mostly white body, a lower waist that’s grey (which matches the corner mouldings) and a red stripe above. Winnebago has resisted the temptation of the ubiquitous aluminium checkerplate. AL-KO is the name on many of the chassis fittings, Independent Rubber Suspension (IRS), drop-down stabilisers, 10in electric brakes and swing-away jockey wheel but not the 16in alloy wheels. Dometic has slightly less on the body — awning, door and double-glazed windows. Across the front, there is a good-sized tunnel boot with plenty of space even with the 100Ah battery, BMPRO 35SR battery management system and breakaway power supply in place. 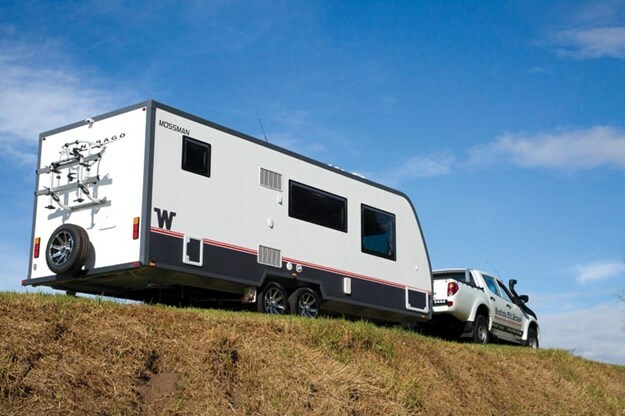 Caravans having an external length of 6.82m (22ft 4in) offer a considerable amount of internal space. Certainly enough so that a family caravan does not feel too cramped inside. Fitting in between the front and bedroom areas is a nearside kitchen bench and an offside L-shaped dinette. That leaves remaining space in the rear nearside corner for the bathroom. A simple design trick for making the most of internal space, or at least the way it looks, is to use light colours and glossy surfaces for the interior colours. It works quite well and certainly does on the interior of the Mossman C.
In the forward area, the island bed is well sized at 2.01mx1.53m (6ft 7in x 5ft) and even that length still has a good walkaround space. Helped in part by the forward habitation door but also resulting in asymmetrical windows on either side — the smaller nearside one also not being able to be opened when the door is open. 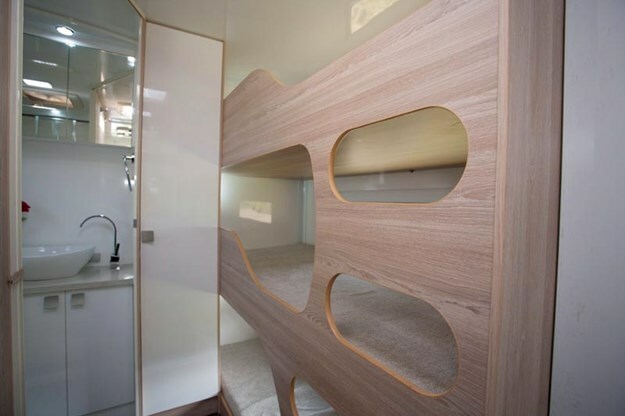 Fitted around the bedhead are the expected overhead lockers and side wardrobes. Lifting the posture slat bed base gives access to the under-bed area but it is foreshortened because of the front tunnel storage. Triple bunks are something of a squeeze in the 2.02m (6ft 8in) interior height but each bed occupant gets enough air space. All the beds measure 1.9mx0.8m (6ft 3in x 2ft 7in) and come with a window and reading light. The plywood cut-out steps do require a certain amount of agility to use. Butted up against the middle of the van is a narrow wardrobe complete with hanging space and shelves. 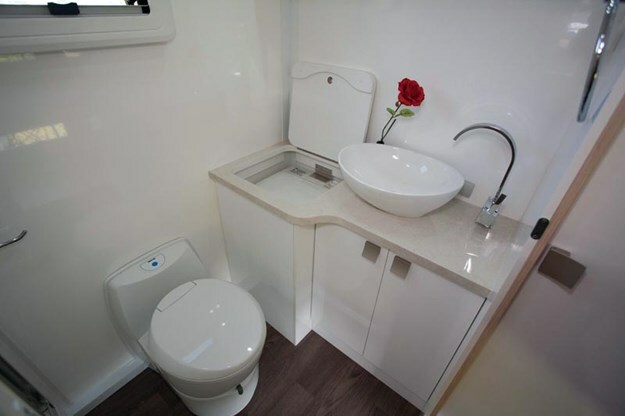 Like the rest of the van, the bathroom is surprisingly spacious with the vanity cabinet in the rear offside corner, cassette toilet in front of that and the shower cubicle taking up the rest of the space, its door facing towards the rear. Included in the vanity cabinet fittings are a pedestal washbasin, mirrored shaving cabinet and top-loading washing machine. Cooking for a number of people does require a reasonable-sized kitchen bench with plenty of drawer and cupboard space, which this one delivers quite well and that includes the overhead lockers and the wire basket slide-out. All the necessary appliances are supplied — Thetford cooktop/grill/oven, stainless steel sink/drainer, Dometic 190L fridge and Camec microwave oven. L-shaped lounges tend to work best in this sort of layout, although I'd suggest that a couple of extra seats might need to be imported for a family of five on the cream leatherette upholstery. Whilst the table does have two pole mountings, I reckon it could do with extra width or, as some European manufacturers provide, an extendable or fold-over table. Overhead lockers are fitted above the table, along with a radio and a flatscreen TV, but viewing the latter is a bit of a challenge from the seating. With a Tare of 2124kg and an ATM of 2950kg, the Mossman C isn’t too heavy in the weight stakes. Although when fully loaded it is certainly over the ‘Prado limit’ but probably reasonably suited to the dual cab ute category. It tracked along quite well behind my Mitsubishi Triton ute, despite it having the best part of 200,000km on the clock. That said, a family travelling fully loaded (and I include the tow vehicle here) might like to consider a heavyweight LandCruiser or something similar, just for safety reasons rather than anything else. 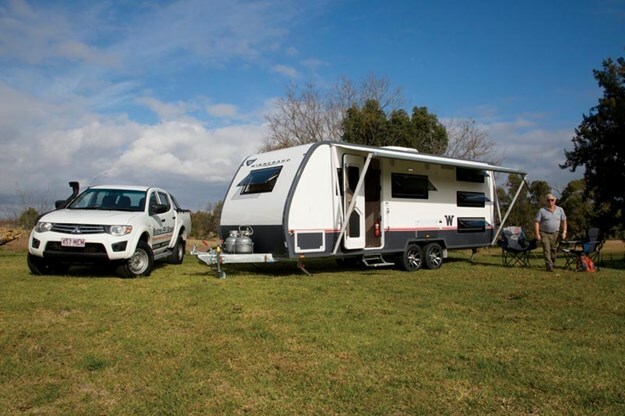 For those whose family budget extends beyond a multi bed, pop-up, pop-out camper trailer, the next step is really something like this Mossman C. With a standard price of $68,804, it might well be expected to give quite a few good family holidays. It’s certainly a spacious van, even more so if an annexe is fitted to the awning which considerably extends the living area. Both the 82L water tanks and the battery/solar panel capacity give the ability for a bit of off-the-grid travel as well.